At the end of World War I, tens of millions of people died in just a few short years. But these deaths had nothing to do with the bullets and bayonets that had taken so many lives in battle. It was, instead, the Spanish Flu, which killed off about 5% of the world's population from 1918 until 1920. Were a similar pandemic to hit today, one of the things we'd need to rethink is how we use our phones. The flu pandemic was absolutely terrifying, killing ten times as many Americans as the Great War did. There was a tremendous sense of hopelessness around the world, with a flu vaccine still generations away and millions of people unsure of how to protect themselves. In the years following the worldwide pandemic, doctors did their best to come up with ways to minimize the transmission of influenza. One culprit singled out by doctors was the telephone. 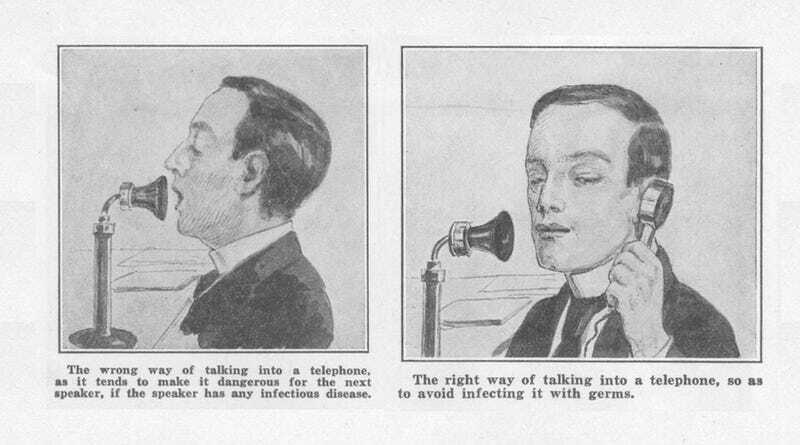 The phone was far from a new technology in the early 1920s, but it was being adopted so quickly (and its intimate design was such an obvious magnet for germs) that it made a lot of sense to educate the public on hygienic use. The illustrations above come from the May 1923 issue of Practical Electrics magazine and accompanied an article by Dr. Albert Neuburger, a doctor in Berlin. As Neuberger explained, public telephones were becoming incredibly common in post offices, newspaper kiosks and offices. So it was important for whoever managed the phone to clean it frequently, and for the broader public to practice safe phoning. One illustration (above left) showed the "wrong way" of using the telephone. The phone user speaks directly into the device, with nary a care in the world. Another illustration (above right) showed the "right way" of talking into the phone. This telephone enthusiast keeps a safe distance from the phone, without speaking directly into it, and even gives it some side-eye for good measure. Here in October, flu season is just around the corner. But unfortunately for us, the CDC's flu surveillance program has been absolutely crippled by the current government shutdown. So should a new flu pandemic hit — killing millions and kicking off a global panic that would almost certainly result in the end of civilization as we know it — just remember to practice safe phoning. Our phones have become repositories for our digital lives. These mobile devices are where we store our photos, music and messages, all of which we pass around in a decidedly low-tech manner: by handing our phones to those friends and family who may be nearby. But that's really the fastest way to pass around something like the flu in our smartphone-obsessed society. So, while the CDC operates a skeleton crew, your smartphone may be the first and last line of defense to make sure you don't become a casualty of the new Great Flu. Plus, even without a global pandemic to worry about, your smartphone is disgusting. Like really disgusting.